Iran says talks with world powers in Kazakhstan to try to resolve its nuclear crisis were a "positive step". Chief negotiator Saeed Jalili said the US, UK, France, China, Russia and Germany (the P5+1) had been "more realistic" than in the past. The EU's chief delegate said she hoped Iran was "looking positively" at proposals presented at the talks. International powers suspect Iran of seeking to develop nuclear weapons - a charge Iran strongly denies. Iran insists its purposes are purely civilian, asserting it needs enriched uranium to make medical isotopes. Russia and Iran said technical experts from both sides would meet in March, and the P5+1 group would meet with Iran again in Almaty on 5 and 6 April. The multilateral discussions were the first since a round in July 2012 ended without a breakthrough. At a news conference after the second day of talks concluded, Mr Jalili expressed cautious optimism. Two days of talks here produced only one clear agreement: the decision to keep talking. Diplomats at the talks believe that this - in itself - should count as an achievement. But talking does not necessarily lead to agreeing. From what we can tell, Iran has not agreed to two of the principal demands made by the P5 + 1 in previous rounds of talks: stop all uranium enrichment and shut down the underground enrichment facility near the city of Qom. "We have tried to put a meaningful, fair and balanced package on the table," said a senior US official at the end of the talks. "We have a lot of work to do." But one party will count these talks as an immediate success: the host, Kazakhstan. The Kazakh government is keen to present itself as an influential voice in favour of nuclear disarmament. It now gets to hold onto its role as host for the next round of nuclear talks with Iran in April. "Some of the points raised were more realistic compared to what they [P5+1] said in the past. And they tried to bring proximity in some points between the viewpoints of Iran and their own, which we believe is a positive step, despite the fact that we have a long way to go to reach the optimum point." EU foreign policy chief Catherine Ashton - the lead negotiator for the world powers - said she hoped Iran would be constructive. "I hope that the Iranian side are looking positively on the proposals we put forward," she told reporters. "The proposals we put forward are designed to build in confidence and enable us to move forward." 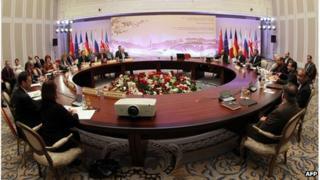 During the opening three-hour session, Baroness Ashton presented what has been described as a revised offer to Iran. The proposal was thought to repeat an earlier demand to stop uranium enrichment and to shut down the Fordo underground enrichment facility. In return, some of the sanctions which have been imposed on Iran could be eased, reports say. Several rounds of sanctions have squeezed Iran's economy, with oil revenue slashed, the currency nose-diving in value and unemployment growing. Reuters news agency quoted Mr Jalili as saying after the talks that there was "no justification" for shutting Fordo, although he said the issue of 20% enrichment "can be discussed in the negotiations... in a view of confidence-building". Since 2010, Iran has been enriching uranium to a level of 20%, an important technological step towards being able to produce more highly enriched weapons-grade material. Iran has repeatedly rejected Western calls to stop enriching uranium, insisting it is an inalienable right. The talks took place against a background of Israeli warnings that it will stop Iran's programme militarily if other means fail. This month, Iran said it had found major new uranium deposits and was planning to expand its nuclear power programme. Only 10 days earlier, Iran announced an upgrade to its Natanz nuclear plant centrifuges - believed to be able to enrich uranium two or three times faster than the old equipment. A report by the International Atomic Energy Agency (IAEA) last week said it could not yet "exclude the existence of possible military dimensions to Iran's nuclear programme".